2. Season the steaks evenly with Montreal Steak Seasoning, set aside. 3. Heat the olive oil over medium-high heat in a large 12 Lodge cast iron skillet. When hot, add the steaks to the pan and brown for 5 minutes per side. 4. 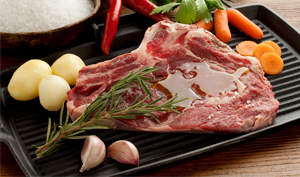 Transfer steaks to a plate; add the remaining two tablespoons olive oil to the skillet, and heat. When hot, add the onion, potato, green pepper, mushrooms, chopped artichoke hearts, garlic, and capers; sauté for 7 minutes, until the onion is translucent. 5. Add the diced tomato, oregano, thyme, and red pepper, and stir to combine, cooking an additional 2 minutes. Place the steaks on top of the tomato mixture and transfer to the middle rack of the hot oven. Bake for 20 minutes, remove, and serve hot.